A Pox on hidden staging! LL - A Pox on hidden staging! I spent a lot of time thinking about what I wanted in my layout before I ever started my version 2. Even visited some guy's layouts, most of which have multiple levels including a Helix and a Nolix configuration. The Helix was too complicated and just takes too much room so I designed and built a nice around the room Nolix. Yes, it worked as planned and I wound up with a two level layout. It was complicated, but it was real neat to look at. I thought it was just what I needed and what I wanted. Then I started running trains. Lots of them and I was really pleased with how I could have such long trains (25 cars) parked in the basement as it was and all I had to do was set the turnouts and let them roll. Sounds easy, but it just turned out to be a lot more complicated than i'd ever imagined. Everything was connected but I just didn't like the flow or the difficulty. Then there were the little problems of getting cars back on the track down in the lower recesses. And maintaining the track down there with only 12" of clearance was just tough. Every problem I had with turnouts was always on the lower level in the rear recesses. As I have been considering expanding my layout into the next room, (see Bigger layout or biger shop) I started thinking about putting the lower level staging in the next room and keep everything at eye level. 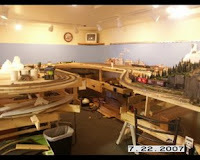 One of my buddies has a very large yard on his 3 3' x 24' HO empire. I spent a lot of time looking at his big yard and pretty well convinced me that I wanted the same. In fact I want two, one for passenger trains, the other for freight. A trip to Laramie last year reminded me of what western prototypes do when they need to store cars, the build a big yard. I hear tell UP yard in western Nebraska is simply immense. So I am actually using the prototype as my guide. Now I suppose that there are some hidden yards of some kind in the bowels of the NY subway or some other subterranean place but my Santa Fe and the other western railroads did not bury their yards! So, I've made the leap, the lower level yard and the Nolix are history. The yard moves to the next room, which actually is now the other side of the same room. So, as I seek to achieve what ever it is I am destined to achieve with my railroad, I wonder secretly how long it will be before I build another level. Update, the first new yard is now operational, and I can get to every track easily and see what I am doing too!